Used Mercedes GLC Coupe Review - 2016-present | What Car? 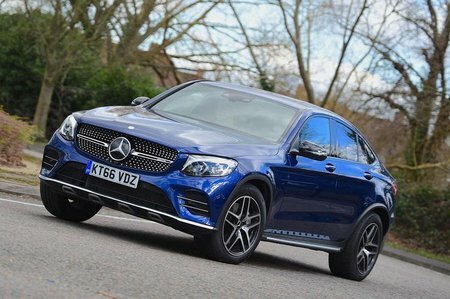 What's the used Mercedes GLC Coupe coupe like? Mercedes knows as much as any other premium manufacturer that style sells. Taking the lead from one or two of its competitors, it’s taken one if its regular SUVs, in this case the GLC, and given it an injection of glamour. The result is the GLC Coupé. Underneath, like the GLC, it’s based on the C-Class saloon. However, the GLC Coupé is lower, longer and gets a more raked rear roofline. This sporting makeover puts it up against cars such as the BMW X4, in effect a coupé version of the X3, and even the pacey and prestigious Porsche Macan. Under the GLC Coupe’s bonnet, new buyers could choose between two versions of the same four-cylinder, 2.1-litre diesel engine, with the GLC 220d producing 168bhp and the GLC 250d pumping out 201bhp. You can also seek out the 350d version, which comes with a powerful yet smooth V6 diesel engine that wafts where the four-cylinder engines growl. If you’re after a petrol powerplant, there’s currently only one option: the AMG-fettled GLC 43. This packs a twin-turbocharged 3.0-litre V6 that provides rapid acceleration. Trims kick off with Sport, which comes well equipped with goodies including variable drive modes, automatic wipers, 8.0in colour screen, sports seats and climate control. 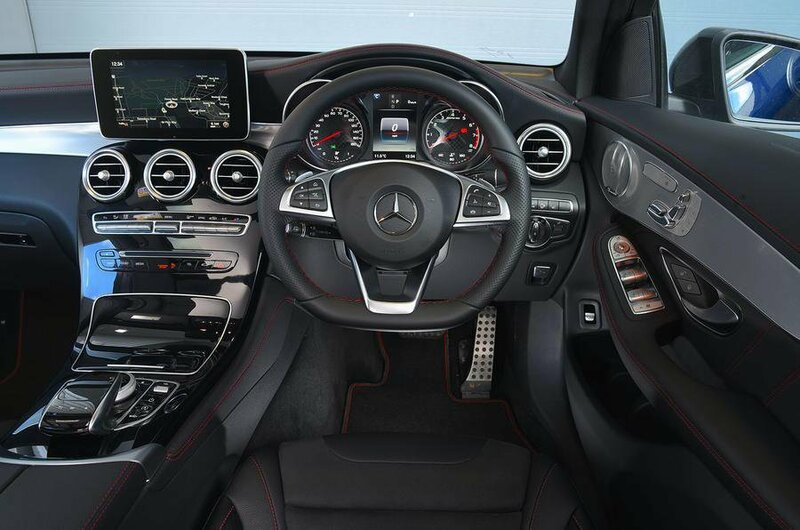 Top-spec AMG Line adds 19in alloy wheels, sportier exterior detailing, sports suspension and AMG interior design add-ons. On the road, the GLC Coupé is punchy enough with any engine option, although the two four-cylinder diesels are noticeably noisier than the six-cylinder 350d. The GLC 43, meanwhile, is a seriously quick car, at least in a straight line, and its petrol engine makes a glorious noise, but it’ll cost you a lot of money at the fuel pumps. The GLC Coupé has a variable-ratio steering set-up that feels a little unevenly weighted, but it corners with confidence, if not with sporting agility. There are two suspension options: a standard non-adjustable set-up and an optional air suspension system. In the latter, the GLC Coupé soaks up rough roads well on standard AMG Line 19in wheels and gives a pleasing floaty cushioned ride on the motorway. Selecting Sport mode stiffens the suspension and adds steering weight and gearbox sharpness, but this doesn't stop the car from leaning heavily in corners. Inside, the driver gets a good driving position with plenty of adjustability to it and reasonable visibility. The sloping rear impedes the view a little, although there is a standard reversing camera on all models. Interior quality is excellent, with well-damped switches and high-quality materials in evidence. New buyers could also have specified an optional Premium Plus Equipment package, which features Mercedes' upgraded 8.0in Comand infotainment system. It has a bright, clear screen and the menus are easy to navigate, even if they are not quite as intuitive as BMW's rival iDrive system. Space-wise, the two up front will be happy, while two rear passengers will be reasonably comfortable too, as long as they’re not too lanky. The GLC Coupé's boot matches the X4’s and Macan’s for on-paper space, but the GLC Coupé and X4's sloping rear rooflines make loading tall items more difficult.